Here’s a great example of applying design to simple challenges in life. Ever wanted to park your car and explore further than your feet might want to go? Well here’s a very unique and clever concept, an electric bike that can fold into a circular shape and fit in most cars spare tire compartments. 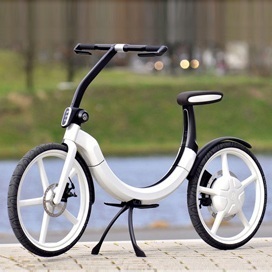 Without pedals, the bike is fully electric with a range of 20km and can reach speeds of up to 20km/h. Could this be a stepping stone to leaving our cars parked, reducing congestion and ultimately a better environment.